Monday and Tuesday will be a tease ahead of the snow on Wednesday. We will push 60 to start the week, but then the strong cold front arrives Wednesday. Rain will start between midnight Tuesday night and 4AM Wednesday. Our temperatures call very quickly and we start seeing snow in the Northwestern portions of Ohio between 5AM and 9AM, (all of this is according to the latest forecast models... and for once they are in very good agreement). Most of the moisture pulls out by noon on Wednesday and the big question is how far south will the below freezing temperatures make it before the precip is gone. Southern Ohio may have little to no time below freezing so it may stay mostly rain. 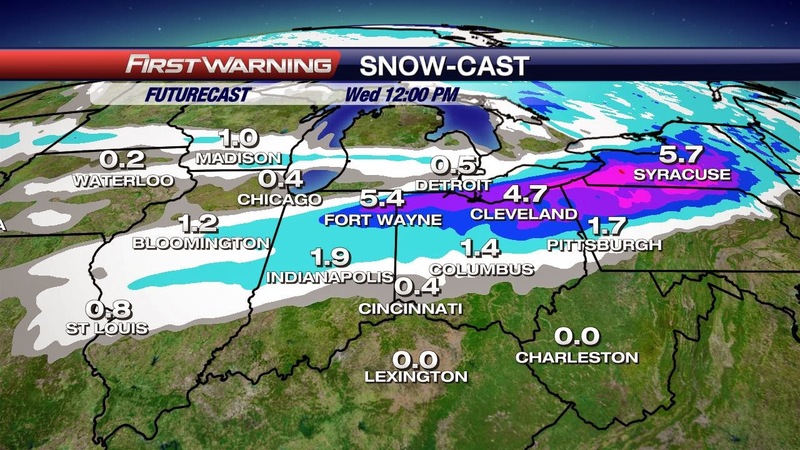 I really like the RPM snowfall map by Wednesday at noon, above. I think far Northern Ohio will see the majority of the snow with this and the transition stage... is once again... over Central Ohio. Go figure right? I will keep you posted, but the RPM has been VERY accurate this winter and feel pretty confident in give you numbers three days out, but there will still likely be some tweaking needed. Enjoy the start of the week and have a good one!